Increasingly we live in a "self-broadcasting culture" with the ever growing popularity of social networking sites such as MySpace and Facebook. Over 50% of bloggers make blog entries to report and share experiences about their personal lives. It is projected that by 2010 there will be over five hundred million web logs; the number doubles every six months. Andrew Keen, author of The Cult of the Amateur: How Today's Internet is Killing our Culture, raises an alarm about the inferiority of amateur content on the Web and the negative effect it is having on our cultural institutions including the newspaper, magazine, music, book and movie industries. VB: The consequences of unbridled Web 2.0 activity that you describe in your book are truly alarming. Everything from devastation of the music industry because of free music downloading, and inaccurate reporting by amateurs threatening the trustworthiness of news, to invasion of privacy on a major scale and identity theft. Andrew Keen: The Web 2.0 activities are disturbing and represent a kind of collective cultural suicide, which is sad because in 25 years we are going to look around and ask where is the music? Where is the talent? Where are the well-developed, well-marketed, well-distributed music bands? There aren’t going to be any and we’ll all be victims of this problem. VB: What proportion of Internet users do you think are aware of the breadth and depth of these problems? If the number is small, as I suspect it is, why do think that is? Andrew Keen: It's very convenient for people to not know about these problems because they're not thinking about the long-term consequences. Young people don't realize that when they steal music online ultimately they're killing the music business. They don't concern themselves with questions like how will musicians earn a living and continue to create their music. Or the question of how will large numbers of citizens earn a living in an economy that is being dramatically impacted by the Internet. I'm not saying all aspects of the Internet are bad. But it's convenient for people to not think about the issues. VB: Do you think the problem may also be a result of all countries not having the same views about protecting intellectual property? Andrew Keen: I don't think so. I think some people will steal music or other intellectual property when they can. Copyright theft in America is just as destructive as it is anywhere else in the world. The problem with the digital revolution is it creates a situation where people can steal music online without worrying about consequences. A lot of people do so because it's convenient and they choose to not think about the long term implications. It's not the same as being in a store with the store owner present to protect the candy. It's more like looting after a natural disaster. Suddenly everyone realizes they can go into stores and take everything because no one is protecting them. The Internet in some ways is enabling a mass outbreak of looting of music. VB: I was interested to read your comments about O’Reilly Media’s Foo camp in 2004. It was there that you first became aware of how narcissism was the governing factor of many Silicon Valley web-based businesses. You call it "the survival of the loudest and most opinionated." That was apparently quite a revelation for you, a wake-up…. VB: An epiphany. And you’ve gone in a very different direction since then. You use the analogy of an infinite number of monkeys inputting away on the Internet and creating blogs at the rate of one per second. With that phenomenal expansion of activity and information, it becomes very challenging for people to cope with the volume on the Internet, doesn't it? Andrew Keen: Yes. It is impossible to cope because nobody can look at all the blogs and most people can only look at a tiny portion of them. This is media that is chaotic and it is hard to find anything of value. What we’re doing is creating new media and then trying to invent filters to get the best of it to people. But that’s what old media is—the best of it. Newspapers, magazines and newscasts have doorkeepers. They have editors, publishers, and people in charge—they are the filters. They are the ones who say okay, this story is worth covering, this writer is worth publishing, and this musician is worth recording, and they make those calls based on substantial experience. Ultimately the so-called filter of the wisdom of the crowd is easy to corrupt. It doesn’t work as well as real human filters, real human doorkeepers. VB: Democratization, undermining truth, scouring civic discourse and belittling expertise…these are some of the ways you describe what is happening as a result of Web 2.0. Has your response changed in any way since you wrote the book? Andrew Keen: I think the argument still holds up. One thing that’s worth noting is that while I’m critical of democratization it doesn’t mean I’m against democracy. I’m concerned about democratization leading to a new kind of oligarch, the oligarch being anonymous Internet activists. We don’t know who is behind much of this often youth-generated content, particularly on the profile side—professional amateurs, or anonymous professionals. Wikipedia is building a large body of "knowledge" and we have no way of knowing the agendas of those creating it. There’s no such thing as absolute truth. All knowledge comes with its own socio-cultural, economic and political baggage. The value of filtered, doorkeepered media is that, at least, we know the identities of the author and the publisher. For example, I find the Fox news distasteful in its messages, extremely biased and corrosive. But when I watch it I know who and where it is coming from. One of the weaknesses of my book is it tends to idealize mainstream media. Mainstream media may not be as ideal as I suggest, but at least it is easier to see through and easier to criticize. And much of it is reliable, I think, and credible. VB: Now with so many advertising dollars being diverted to Web 2.0 businesses the traditional media are getting less advertising income meaning they have less to spend on careful investigation and accurate reporting. VB: What do you think it will take to wake users up to these problems with the Internet and how it functions? Obviously your book…. Andrew Keen: Yes. Serious discussion. Suddenly waking up one day and not being able to buy the New York Times. Suddenly waking up one day and realizing there aren’t any more record labels. Realizing that you can’t be a journalist any more because no one is willing to pay you. Realizing that your view of the world, like what you know about Iraq, is dependent on anonymous sources, which could even be based in Iraq and stem from a rigid agenda. In the past we've had credible journalists whom we recognize. All these things are ultimately going to wake us up. Also, more and more, we will hear scandalous stories about stuff that is made up, about conspiracies on the Internet, about dishonesty. VB: That should wake people up. Andrew Keen: Yes, but the core problem is that we’re living in a culture that is increasingly narcissistic. People come to the Internet simply to confirm their own views. Views that often are not based on anything substantial. Also there is the continuing increase in personalized networks. The problem of narcissism—which is a problem, I think, of post or late industrial society—is one that has been observed by a number of sociologists, including Christopher Lasch, Neil Postman and Daniel Bell. The Internet is allowing this narcissism to create a platform for a sort of flaring of itself. Narcissism is not a new problem but the Internet is bringing this old cultural problem to a kind of climax. VB: Is narcissism more of a problem in wealthy societies? Andrew Keen: My book is not directed at the developing world. It says nothing about Iran, China or Tibet—maybe a little about India. The book is a criticism of technology and culture in late industrial society. It is not about China or Iran where the situation is entirely different. When you blog in the US in a political way you can say whatever you want. When you blog in China in a political way you get put in jail. One obviously has a completely different opinion of bloggers in a society without a free press where traditionally you’ve got to tell the truth. Some people will argue that the media in America doesn’t tell the truth but I think much of it does. It has done, and continues to do, a good job, certainly a better job than the bloggers. Ironically many bloggers depend on traditional media for the seeds of their information. VB: Could the Internet and Web 2.0 be used to cure itself? Andrew Keen: No, I don’t think it can be self-corrected. The only thing that can correct it is the market. Most of the user-generated websites won’t work and they will go out of business. I’m not a market fundamentalist. I think markets tend to bring out the worst in media—things like reality television and American Idol. Companies like Google and YouTube are making fortunes selling advertising space. I’m not against the free market and I’m not against Google or YouTube making fortunes, but I think it is important for people to understand the consequences of web companies making fortunes, of tiny groups of technologists making enormous amounts of money while many creative people and knowledge workers are not participating in this revolution, and thus are not benefiting from it or being paid for their work. VB: A lot of people are creating blogs—and there's MySpace, Facebook, etcetera—but not a lot of people are looking at all this material. Is that your view? Andrew Keen: Some people are looking at it. VB: Where do they get the time? Andrew Keen: Exactly. The scarcity in our modern economy is attention. A tiny portion of people are very literate about the blogosphere and spend a lot of time on it, but the majority doesn’t because it hasn't got the time. As you say, people are too busy. What they need is their media delivered to them. They don’t have the time or energy after a day at work to troll through the blogosphere looking for news, especially when half of it is unreliable and from unknown sources. That’s why the newspaper is such a good tool. You can sit in the evening and read a reliable newspaper to find out what’s going on the world. The editor of the New York Times or The Financial Times delivers the important news to you. They have authority and you have faith in that authority. The problem with the Internet is that it undermines all that. Now we're the ones who have to decide what’s important. How can we when we have no first hand experience of what has been happening in the world? Do we rely on the crowd, the millions of other people like ourselves who don’t know any more than we do? That’s the problem. It’s the blind leading the blind. VB: Do you think social networking might be in a “sweetheart” phase and that people will ultimately realize how boring, vacuous, and unfulfilling it is? Andrew Keen: It may be. The problem with social networks is that they have not yet proven themselves as businesses. Facebook, which has no coherent business model and a 24-year-old CEO who has no business record, is valued at $15 billion. I think that reflects the absurdity of the situation. The problem with social networks in business terms is that they are dependent on being an authentic environment without advertising. People congregate there and are comfortable networking with one another. Once you introduce intrusive advertising it becomes less attractive. But in order to translate the huge audience of the social network into dollars, that’s what you have to do. So the whole context of the social network business might be premised on a commercial contradiction. Social networks are not going to go away. Some people like them. They have some value as business networks, they have value for kids. They can be fun. On the down side they can be an excuse for narcissism or for ignoring newspapers and result in a personalized media where you trust only your own network—which really amounts to watching yourself, listening to yourself, and hearing yourself like in an echo chamber. VB: I’ve read that some people, especially young, impressionable people, are recording all kinds of things about themselves—their histories and thoughts, and even pictures of themselves doing things that could come back to haunt them in the future. Because it becomes a permanent record. Andrew Keen: Yes. One thing the Internet hasn’t learned to do is forget. And you are absolutely right. Things will come back to haunt some of the younger users. Though, ultimately they should learn from the experience and hopefully will educate their own children about such dangers. Kids have responded to this kind of argument saying they know what they’re doing, they like revealing themselves and I think they have a point. It's a cultural revolution, and an interesting one. I am uncomfortable with it. I wouldn’t reveal myself on the Internet. But it is an interesting cultural revolution. I’m not quite sure of the point of it but it’s exciting for those who participate. I don’t have a problem with self-expression as long as you realize there is more to life than that. If you want to understand the world you pay for content, you learn from other people who know more than you do. VB: There have been attempts to control and regulate Internet activity. Do you have any thoughts about that? Is that do-able? Andrew Keen: No, it’s not do-able and government is becoming less involved and less confident. The only way we can control it is by our usage. We have to use it responsibly. VB: Do you think companies who advertise on the Internet are becoming aware of what you describe as “click” fraud, where people repeatedly click on sites in order to increase their visitor numbers and advertising dollars? If so, are companies starting to withdraw their advertising dollars from some Internet sites? Andrew Keen: I don’t know. I haven’t really followed that. I’m sure that they’re aware of it. VB: It is unfortunate given how much advertising money has been diverted from traditional media, where this type of fraud couldn't happen. Andrew Keen: Yes. It’s one of the problems with the nature of the Internet economy. VB: Have you had a good response to your book? Andrew Keen: Oh yes. It’s had an impact on many people. It’s created a debate where there wasn’t one before. It’s not a fair book, not a balanced book. It takes a very polemical position. It attacks the Internet and some of the attacks are fair, others probably aren’t. Some of the attacks on people are fair, and some may be a little under the belt. But basically it succeeds in what I wanted it to do which was to create a debate about these issues. VB: Hopefully it will result in a more balanced view and more balanced action. Andrew Keen: Yes. When there is debate people think more deeply and constructively about the issues rather than accepting the utopian idea that the Internet is taking us into a promised land of creativity, self-expression and self-realization, when, in fact, the reverse is true. VB: Do you think some of the activities we’re seeing in the 21st Century, which make certain types of knowledge and information widely available, is a positive thing? Andrew Keen: Definitely. The Internet is great. I imagine I’m being misunderstood as a result of the book. The subtitle—how today's internet is killing our culture—is rather polemical and inaccurate. The Internet isn’t killing culture. I couldn’t live without the Internet. I couldn’t live without e-mail. I couldn’t live without the electronic medium for the distribution of reliable information. VB: You’re not arguing for the good old days, you’re arguing for…. Andrew Keen: I’m arguing for a synthesis of Web 1.0 and 2.0, for maintaining the Internet but reminding ourselves that professionals are more reliable than amateurs. The blogosphere uprising of self-expression doesn’t have much value. I’m in favor of academics, professionals, expert journalists, real musicians, and real filmmakers using this medium. I’m not in favour of the idea that getting hold of a camera or a keyboard makes a filmmaker or a writer out of an amateur. Training and experience are required. VB: We've all seen how electronic forms of commerce like Amazon.com or iTunes have resulted in closures of small local book and music stores. Do you think individuals could make a difference by choosing to shop at their locally owned stores rather than on the Internet? Not to go after Amazon, but they have such a large number and range of books it seems easier to go there, than to the local bookstore. Andrew Keen: Yes and we’re all guilty. Me as much as anyone. It’s easy and convenient. Andrew Keen: So we have to understand that when we use the economic and physical convenience of Amazon we are ultimately killing our local bookstores. VB: You point out in your book how more and more of the advertising dollars which traditional media have relied on are being spent instead on Internet sites. Do you think there is any way to lure some of that advertising money back to the traditional media—to newspapers, television, radio and so forth? Andrew Keen: Mainstream media need to develop high quality websites in order to attract those advertisers who are comfortable advertising on the Internet. They may not be advertising in The New York Times newspaper, but their advertising dollars would be going to the same company. VB: You don’t think the establishment of active websites has been a part of their downfall? Andrew Keen: Fewer people are reading the paper—this is just a reality. The electronic media are the future of music and news, among other things. Like it or not we can't change it. So media companies have to become digital businesses that attract advertisers. There’s no alternative. VB: There’s no turning back. Andrew Keen: No. That’s not necessarily a bad thing. I don’t really care where people read The New York Times, whether on- or off-line. It’s still the same articles, the same information. It doesn’t really matter as long as they’re reading it and not some unreliable blog by someone who doesn’t know what they're talking about. VB: I guess as long as The New York Times can continue to afford to provide well-researched news and…. Andrew Keen: The problem is that what mainstream media was earning in dollars with traditional formats has translated into pennies on-line. The challenge for companies like The New York Times is to generate the kind of revenue necessary to make their business viable on-line and to allow them to continue to employ foreign correspondents, editors and all the other staff that distinguish The New York Times. In order to earn that type of revenue you need to have massive traffic. And once you have that massive traffic, it means a paper like The New York Times may have to dilute its message in order to maintain that level of traffic. So instead of a headline about Lebanon, there might be one about Britney Spears or Eliot Spitzer. That’s the problem with a digital business—you need a much larger audience than with an analog business. To build that size of audience you need to dumb-down your message. That’s the real problem and one The New York Times is currently dealing with, perhaps not very successfully. They recently announced they were laying off a number of writers and reporters which is very, very troublesome. Because therein lies the value of The New York Times. It’s not the brand. It’s that they employ high-quality writers who report on interesting and important stories. They have editors who fact-check to make sure it’s reliable. That’s what distinguishes The New York Times from the blogosphere. If The New York Times goes on the Internet and allows anyone to write anything on its website, then it won't be The New York Times anymore. It will be just another worthless blog. VB: That’s worrisome in terms of political debate and discourse, isn’t it? In a democracy we want, and expect, ideas to be explored in-depth. This dumbing-down of the message will lead more and more to the ten-second soundbite. Andrew Keen: Yes, and that’s another big problem. In this way the Internet is not a new thing, but a continuation of an old theme. Television has been very guilty of dumbing-down discourse, of narrowing everything down to a soundbite. The Internet is one step beyond low-end television: poor quality, unreliable and cheap. In some respects that’s what television has become as well. VB: Your book explores the potential negatives of user contributions to websites, such as the planting of positive product reviews by manufacturers or negatives ones by their competition. Do you see any areas where user contributions are trustworthy and valuable? Andrew Keen: Yes, I think Amazon does a pretty good job. Their consumer reviews are generally reliable. I think they encourage people to be honest and credible and not be anonymous. It hasn't been so great for my book because it seems to have attracted people who didn’t like the book. Maybe it’s not a great book. I think reviews of hotels can be helpful. I don’t do a lot of this type of research but I’ll check out a hotel and maybe read what people say. I generally find what they say is pretty accurate. If people reveal who they are then on-line reviews can work. VB: Now that we’ve talked about the negative things, what do you think are the best things about Web 2.0? Andrew Keen: It’s energetic and irreverent. It’s given mainstream media a good kick in the pants. It’s made a few people very rich, which, I guess, isn’t a bad thing. It’s created a lot of excitement around the Internet. It’s encouraged a lot of other people to get on it. It’s attracted smart people, creative people. In some ways I think it's one of the most dynamic sectors in the American economy. Given the crisis in industrial production, the crisis in banking and finance, and the weakness of the state and state services, Internet business is still one of the most dynamic and viable parts of the American economy. VB: Do you think reporting that is penetrating and accurate, and not treated like entertainment or sensationalism has the potential to draw large audiences? I’m thinking about mainstream media. Andrew Keen: Unfortunately, it seems like most people want stuff that’s dumbed-down. They want truth in ten-second nuggets but they don’t want to understand it in detail. That requires the discipline and commitment of a serious student of the world. If you don't already have that level of interest, it doesn’t matter what the newspapers do. VB: You say there is no absolute truth. Is truth then relative? Andrew Keen: It’s not relative. Just because there is no such thing as absolute truth doesn’t mean that all truth is relative. They are two different statements and one doesn’t lead to the other. What I mean is that all knowledge comes with a cultural, social, political and economic context. When The New York Times editors decide that something should be on the front page of the paper it helps to understand the paper’s agenda. VB: It’s very much influenced by that person’s knowledge, intelligence, experience, wisdom, point of view? Andrew Keen: Yes. Being media literate means knowing this and being able to contextualize news and information, which in turn requires a media that is accountable and not anonymous. Professional media. The problem with electronic media is that it doesn’t lend itself to media literacy. VB: You observed that undermining a truth is stifling creativity. Would you talk a little bit more about that? Andrew Keen: I don’t remember saying that. I don’t know what it means. Truth and creativity are entirely different. The thing about creativity is that it needs to be rewarded. If you’ve got someone who is really creative, a good writer, singer, musician or movie maker they should be rewarded for their work. They need help in terms of improving and distributing their work. But the problem with this new Internet media economy is that it isn’t about finding and helping talent. I’m fearful that the really talented people are not being discovered. I acknowledge that mainstream media didn’t discover all talents and that some of the stuff it discovered has been pretty bad, but it has also been very good at finding and developing talent. In music, for example, the great icons of popular music over the past 50 years were all discovered and developed by mainstream media, by music labels and their marketing people. We’re not seeing this happening in the new economy. VB: The term “the wisdom of the crowd” which some people use to describe Web 2.0 activity is really an interesting oxymoron isn’t it? Andrew Keen: Yes. I think the wisdom of the crowd is actually the interest of a small group of people. I’ve read the book The Wisdom of the Crowd and I accept the fact that sometimes when a group of people get together the sum total of their intelligence is more than the individual intelligence of a single person. But I don’t think that for the most part it works on-line. VB: But it can work with groups of people who are working on specific problems or tasks? Andrew Keen: Yes, it works for software I think. You can have the wisdom of the crowd in terms of building software like Linux. But when it comes to culture, when it comes to a book, the crowd can’t author a book. The crowd can’t make a movie. You can have a group of people which is organized in such a way as to create something. For a film you would have a director, cameramen, scriptwriters, and others. The labour would be split based on talent, skills and knowledge. The idea of some sort of flattened crowd or group of individuals collectively contributing to a cultural product—whether a book, a song, or a movie—is an illusion. Books are the sum consequence of a group, but a group with a clear division of labour—writer, editor, publisher, fact checker. There’s no evidence that the on-line crowd can write a book or a song. VB: There have been some. We Are Smarter Than Me is one. Andrew Keen: Yes, there is this type of book now. I just did a review. One is called We Think and there’s another called Here Comes Everybody. Group is now the latest fashion. VB: Are you basically optimistic or pessimistic about where the Internet will lead us? Andrew Keen: More optimistic than pessimistic. I’m certainly more optimistic than I was when I wrote the book. The book is excessively pessimistic. I’m more realistic now and more balanced in my views. There is some potential but we’re still in a period where I'm worried about the future of certain institutions. I'm thinking about newspapers and the music business. VB: Are you currently working on another interesting project? Andrew Keen: I’m thinking about my next project. I haven’t formally announced it but I’ll be doing something interesting. VB: Another book or article? Andrew Keen: Yes. I do a lot of writing. I have a column in the London Independent and I do a lot of other writing, publishing and broadcasting. The unquestionable benefits of Web 2.0 may be questioned by the laid-off newspaper reporters, bankrupt independent bookstore owners, starving musicians or out of work movie makers. Innovative business models are emerging that take advantage of the new technologies and preserve the rights of creators of works such as books, music and movies. As consumers we need to do our part by not illegally downloading music or otherwise ignoring the intellectual property rights of these creators. 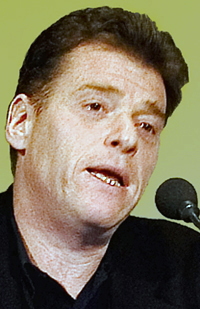 Andrew Keen has a bachelor's degree in history from the University of London and an MA in political science from the University of California, Berkeley. He was a Silicon Valley entrepreneur and currently is the founder and host of AfterTV, a podcast show that focuses on the social, cultural and political consequences of the digital media revolution. He regularly appears on radio and television. Vern, You've done it again. Congratulations on a thoroughly engaging interview. Even though I couldn't disagree more with Keen's elitiist paranoia, I love the way you handled and concluded the interview. Hi vern, I really enjoyed the discussion with Andrew Keen. Son Scott has been struggling with this question for a number of years. He left corporate broadcasting because of their lack of commitment to innovation and creativity, so I am not sure that he would agree totally with the author's premise. As a content creator, he is now attempting to understand the needs of both the old and the new, and to market to both. It's a daunting task.